Have a question? We're here to help you earn and redeem points with Rewards for Good! If you don't find what you are looking for here, contact our customer service team at 1-866-451-6305. What is Rewards for Good and how does it work? Rewards for Good is a free rewards program that gives you points for using many of the tools and resources found at AARP.org. The more you take advantage of the benefits on AARP.org, the more points you earn. Points are used toward the cost of the retail price of some of your favorite items. You can redeem your points to get exclusive savings on top brands, special deals from local retailers, and live auction and sweepstakes opportunities on the Rewards for Good site. Who can participate in Rewards for Good? Do I have to be an AARP member? Anyone over the age of 18 can participate in Rewards for Good by simply creating a free account at AARP.org. AARP members earn 50 percent more points for participating in earn activities. 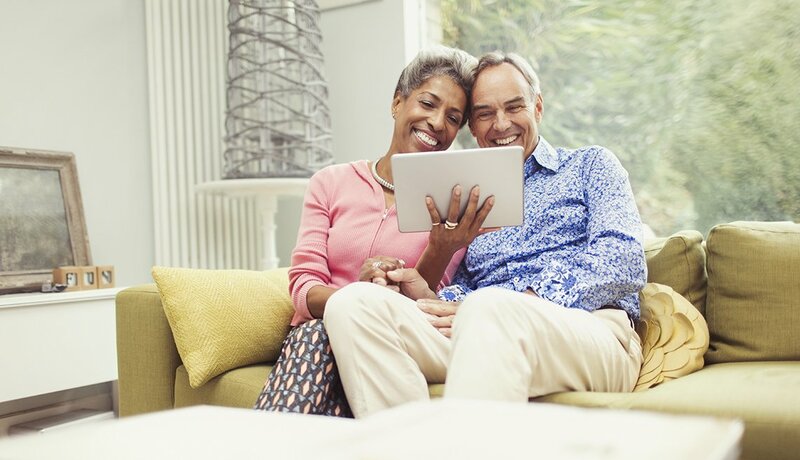 If you’re not a member, you can receive points just for joining AARP and members can earn points for renewing online. Join now. You must register or log in at AARP.org in order to get started. Once registered/logged in, you can search for earn activities to acquire points toward redeeming items, entering sweepstakes or bidding in auctions. The program is free and activation is easy! Get started today! There are literally hundreds of ways to earn points throughout AARP.org. Once you’re logged in, look for the Rewards for Good badge next to quizzes, tools, webinars and more across several categories — all designed to help enrich your life. Whenever you use one of these resources, you automatically earn the designated points. Visit our Earn Points page to see a complete list of activities in the program. Remember, you must be logged in to AARP.org in order to earn from completing activities. You can also earn points for joining AARP or renewing your membership. You’ll also receive a bonus on your AARP membership anniversary. Please note, not all tools, quizzes and activities on AARP.org are part of the Rewards for Good program. So keep an eye out for the special gold badge. For your convenience, check out the Earn Points page (within the Rewards for Good) section, found here . Remember, you must be logged into AARP.org first in order to earn points from completing these activities. We’re passionate about improving your overall Rewards for Good experience. Point-earning activities may change at any time as a result. Yes. You can only earn 5,000 points per day. The points you receive from joining AARP, registering with AARP.org, membership anniversary bonuses and completing Fitbit goals, are excluded from the daily limit. Can I earn points for completing the same activity more than once? It depends. Some site activities can be used daily, some weekly, some monthly and some only once. The Rewards for Good badge on the site activity will let you know if you are eligible to earn points. As long as you’re logged in to AARP.org, your account balance will appear at the top of the page. Use your points to redeem more than 175,000 local dining, shopping and entertainment offers available throughout the U.S. If I win a Sweepstakes, how will I be notified? All Rewards for Good Sweepstakes winner will be notified by email. Be sure that all of your contact information is correct so that if you are chose as a lucky winner, we will be able to contact you. Rewards for Good participants can donate a maximum of 1,000 points per month to AARP Foundation via the redemption catalog. Your points donation will connect vulnerable older adults with the assistance they need to take on challenges from foreclosure prevention counseling to food assistance and more. AARP Foundation is a non-profit 501(c)(3) charitable organization. No goods or services are provided to you in consideration for your generous contribution. Your contribution is tax-deductible to the full extent allowed by law. Please consult your tax advisor. How do I find local merchants offering Rewards for Good deals? Just go to the Local Offers section of the Rewards for Good site and enter your address. You’ll see a listing of printable coupons for dining, shopping and entertainment deals in your area. How does AARP acquire the Local Offers and Vendors used in the Rewards for Good program? The Rewards for Good program is solely owned by AARP. The Rewards for Good catalog and redemption center are operated by our approved service provider Deluxe Financial Services, LLC, dba Deluxe Rewards. The local offers are procured by HSP EPI Acquisition, LLC dba Entertainment®. If you have any questions regarding your local offer coupon, please contact 1-888-842-2891 for assistance. I made a purchase using my Reward for Good points and credit card. When will I receive my purchased item? Most items ship within five business days. You will receive a confirmation once your order has shipped. What happens if I find a less expensive price for an item in the rewards catalog? I think I earned points that weren’t added to my account — what should I do? If you believe you have earned points that are not appearing in your account balance, call our Customer Service Department at 1-866-451-6305. A representative will be more than happy to assist you. No, points are nontransferrable. However you can always use your points to buy gifts for family and friends. If you would like to close your account, please call Customer Service at 1-866-451-6305 Monday through Friday, from 9 a.m. to 6:30 p.m. ET, and on Saturday 10 a.m. to 3 p.m. ET. If you have multiple accounts that you would like to combine, please call Customer Service at 1-866-451-6305 Monday through Friday, from 9 a.m. to 6:30 p.m. ET, and on Saturday 10 a.m. to 3 p.m. ET. If you would like to update your profile information, please visit AARP.org and log in to the Rewards for Good site. Once you are logged in, visit the Update Profile page in the Account section. Make the most of your reward points! Watch our fun video to find out how. 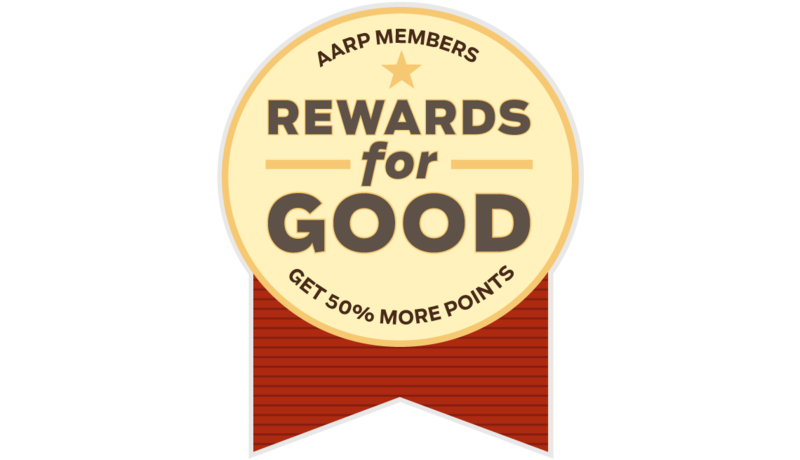 Rewards for Good from AARP lets you earn points and redeem them for savings towards gift cards and merchandise. You can also use your points for auctions, sweepstakes and local offers! Earn points on hundreds of online activities designed to enrich your life through smart savings, healthy eating, dating, retirement tips & so much more! Our retail price is the lowest found in the online marketplace.